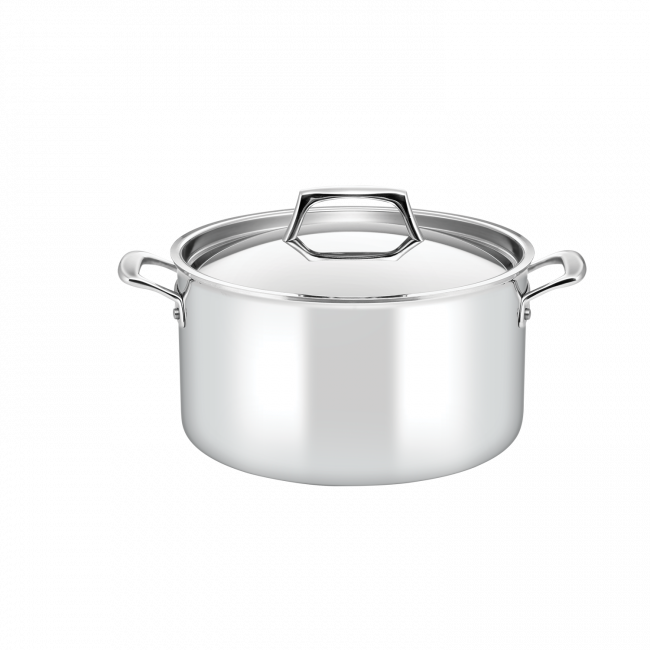 The Essteele Per Sempre 26cm/ 7.6L covered stockpot combines premium quality materials with world renowned Italian engineering to create beautiful, chef-choice cookware. The thick, fast-heating core allows the pan to heat the base and all the way up the sides simultaneously, giving this cookware perfect heat control and optimum performance. This 26cm stockpot with its 7.6L capacity is perfect for sauces, soups and stews and will keep that perfect simmer point for hours. Essteele Per Sempre 26cm/7.6L Covered Stockpot is rated 4.8 out of 5 by 6. Rated 5 out of 5 by interestification from excellent product Well worth the money. Power saver. Easy to use. Great. Rated 4 out of 5 by Amun19 from Fantastic, sturdy pot but difficult to keep clean! I bought this pot a months ago along with the per sempre set of 3 saucepans. They are great saucepans - they are very solid and heat and cook well. Only thing is that they are difficult to keep clean. When you wash them in hot soapy water, marks always seem to appear, particularly on the inside of the pot. Otherwise very happy with my choice. Rated 5 out of 5 by Da David Who from Love it! I mainly use it for slow cooking on stove. It looks great and great quality, just the size for me.